Grey's Anatomy sure loves to have their own doctors have impossible tumors to resect. 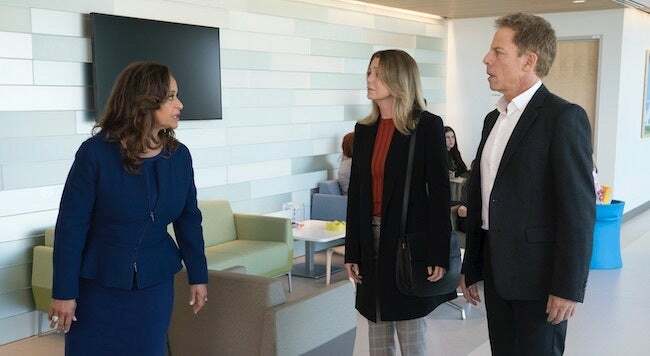 Thursday's episode of Grey's Anatomy saw Meredith (Ellen Pompeo) and Thomas Koracik (Gregg Henry) fly to Los Angeles to meet up with Catherine (Debbie Allen) to help treat a VIP patient with a rare tumor. After they arrive at the new Catherine Fox medical center, Meredith and Thomas are shown the scans of the serious condition and Thomas says nothing can be decided when it comes to approach before meeting the patient. Catherine shocks both doctors when she reveals that she is the patient with the spinal tumor. "Catherine, why aren't Richard and Jackson here?" Meredith asks her. "They will know when there is something to know," she says before they head to get a biopsy to figure out if the tumor is cancer or just a growth. "Nooooo this can not happen to Catherine and this family," another Twitter user said. As they do the biopsy, Meredith wonders if Catherine could have cancer. Koracik tells her to let science give them the answer rather than worry about it. After the procedure, Meredith arrives to find Catherine and Koracik singing a song and having a sweet moment. She asks if she can finally call Richard, who is dealing with his own emergency at the hospital with the death of a nurse he was treating. With the results of the biopsy looming, Catherine begs the doctors to give her their plan to treat her should the tumor be cancerous. "Why do we refuse to talk about it? If I have cancer... your tip toeing around does not make it better," Catherine says. The three doctors sit down to drink at a bar and she ensures them that even if they try not to talk about it, she is still thinking about whether or not she is sick. "There's nothing you could possibly say that is worse than what I have been imagining since the second I saw those scans," Catherine admits. After Koracik walks out to go to the bathroom, Catherine tells Meredith she is worried about Richard (James Pickens Jr.). "When I look in Richard's eyes, he's barely holding on. His sponsor died and he hasn't replaced her and if I tell him this," Catherine says. Meredith reminds her that Ellis Grey also lied to Richard about her diagnosis and that only caused more pain. Koracik arrives and says the results are back, they decide to have one more drink before heading back to find out the news. Catherine later does a ribbon-cutting ceremony for the new medical center and it is revealed that she has a serious spinal cancer. She tells Meredith and Koracik to get to work to figure out how to save her, as she has no intention to stop fighting. Looks like Catherine's journey to good health will be a complicated one for the rest of the season. Grey's Anatomy will air its fall finale Thursday, Nov. 15 at 8 p.m. ET on ABC.